The Digital Divide, or the disparity between internet adoption rates between various groups, has been a topic of conversation since the internet became a commercial entity two decades ago. There is a great deal of warranted concern about the long term impact on those unable to easily gain access to the internet. In recent years, due in part to smart phone use, the disparity in internet access has narrowed. However, there are problems looming which makes the Digital Divide look like a minor inconvenience. The most pernicious problem is the lack of diversity in the information we can easily discover online. For a casual observer, or someone new to the web, this may not appear to be a significant problem because one can’t know what is unknown. However, as a keen observer of the World Wide Web for almost 20 years the impact has been devastating — particularly when it comes to Black owned, independent, content producers. Try this experiment: Search for a news story on the recent 50th anniversary of the March on Washington. 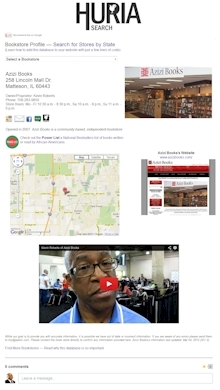 Did a single story from a Black owned newspaper or website come up on the first page of results, the second or even the third? It is worth noting, only 6% of searchers click on the 2nd page of search results. One can make the case that newspapers like The Wall Street Journal, The LA Times or The Guardian (which topped my results) have more resources and therefore should be at the top of one’s search results. However, I’d argue that the coverage of this seminal event in Black culture by the local reporters of The Afro-American, District Chronicles or the Washington Informer newspapers deserve to be returned higher in the search results. The difficulty in discovering the websites of Black owned newspapers has a direct and adverse impact on the viability of these newspapers. Conversely, search engines support large websites by returning the largest sites highest in search results — contributing to their growth. It does not matter whether search engines and big sites are deliberately colluding. The results are clear, Black independent websites are buried too deeply in the search results to be easily found. Fortunately there are many things we can do to counteract this problem. Indeed the very tools which are crowding out independent Black websites can be used to uplift and support Black them. We just have to be willing to do something. Here are 5 thing you can do today. Huria Search is actually driven by a fee based version of the Google search engine. Paying the fee allows me to strip out sponsored search results, eliminating all advertising. The results are curated — only independent, Black owned websites are returned. Try the experiment described earlier: Search for a news story on the 50th anniversary of the march on Washington using Huria Search. You’ll notice a stark, hopefully refreshing, difference in the search results. I suspect you’ll discover an interesting website that you were previously unaware of on the very first page of results. Visit this page to learn how to add the Huria Search engine to your website. You can provide a valuable resource to your visitors by adding this database of independent newspapers, who have a website, and are a member of the National Newspaper Publishers Association (NNPA). These newspapers are important because they provide local coverage of news that is relevant to the Black community. This resource is actually a full blown website site. Give your visitors the ability to search for an independent bookstore by state or name by displaying a feature rich website showing business hours, social media, video, directions, photos and more — all dynamically updated. Click here for instructions. The Book Look is a rapidly growing and popular online video program about Black books, authors, events and more. The Book Look video is updated twice a month. You simply place the code and we do the rest. Learn more about The Book Look and how you can share this wonderful program with your visitors. The Power List is the only national bestsellers list focused on books written or read by African Americans. The Power List accumulates data on these books and compiles that information into a quarterly best-selling books list. It is a joint project established by AALBC.com, Cushcity.com and Mosaicbooks.com. “The Power List” is published four times per year, in the spring, summer, fall and winter. You can make this list available to your visitors very easily. All of these resources can be added to your website by simply copying and pasting a few short lines of code. You never have to touch the code again. All updates and changes take place automatically. This is just the beginning. There will be additional enhancements to the resources above and I’ll introduce new resources in the future. Right now I’m working on a shareable databases of Black book websites and Black owned magazines. These resources are provided free our charge to anyone interested in supporting independent Black voices on the World Wide Web. It is crucial that we help independent Black platforms thrive online. Let’s be clear, your help is needed and mutual supports is required. Large corporations will not do it for us, nor will they produce acceptable alternatives. They simply do not have our best interests in mind. If you are developer and would like to volunteer your expertise or if you have access to information you would like to share please contact me at troy@aalbc.com. Finally, while these services are provided at no cost, they are not free. Google search, website thumbnails, web hosting, domain name registration, and most significantly development are not free. If you are interested in financially supporting my efforts to uplift and support our voices online, then please consider making a contribution (50% tax deductible) here: http://www.huria.org/support.html. Question: Troy, I’d like to support this effort, but I don’t have a website and I can’t afford to provide financial support. What can I do? Answer: You can help raise awareness of this situation by sharing this article with others. These issues impact everything from journalism to entertainment, online and off. Again your support matters and is needed.